To support women’s participation in politics, the Community of Democracies implemented “Advancing Women’s Political Participation” project, funded by the Republic of Korea and organized in cooperation with the United Nations Development Programme (UNDP) and International IDEA. As part of the project, five regional consultations were held on the margins of large international democracy-related events in Europe, Asia, Africa and Latin America. Consultation brought together politicians, state officials, civil society activists, academics, and members of international and regional organizations to discuss gender equality and strategies for advancing women’s political empowerment in the MENA region. 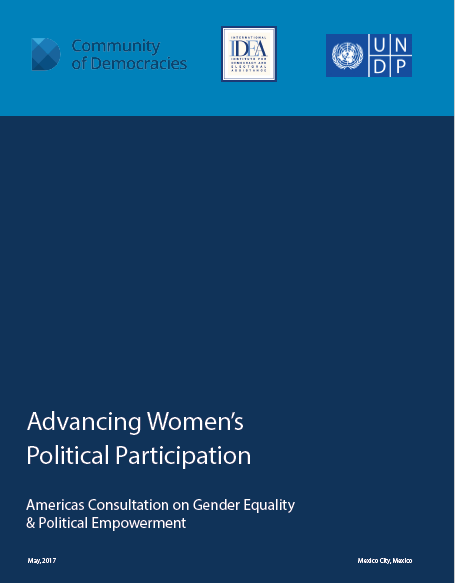 3) best practices and recommendations on how to effectively advance gender equality and women’s political participation.